As you’ve no doubt seen on some form of social media at some time over the last week, the ALS Ice Bucket Challenge, a viral online campaign which encourages people to dump ice water over themselves to raise money and awareness for organizations supporting research into and treatment of the neurodegenerative disease ALS is the biggest thing going on the internet right now. (FYI, ALS is also known as Motor Neurone disease in Britain.) The idea is that you face down the bucket of ice water then nominate three friends to do the same within 24 hours and make a donation. Pretty much every famous person you can think of has done this – from President George W. Bush to Oprah Winfrey to Bill Gates to Chris Pratt. And, of course, everyone’s favorite Brit of the moment, Benedict Cumberbatch. Who, quite frankly, may have done the most epic take on the challenge yet. 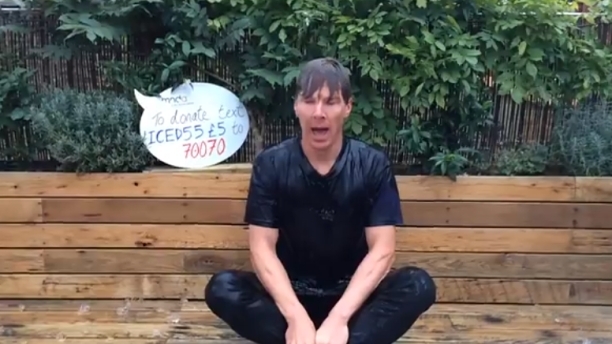 Cumberbatch douses himself with water no less than five times, and there’s a motorbike involved and his shower makes an appearance, among other things. Yeah, so, game on, rest of the world. Several other notable British celebrities have also taken part in this viral charity effort this week including Tom Hiddleston, Matt Smith, Luke Evans, Rupert Graves, Robert Pattinson and more. In the interest of fairness, it seems wise to present them to you as well, so that we may better judge whose is really the best. Video of Rupert Graves Water challenge. As you can see, everyone is getting involved in this. If you’d like to see more celebs dumping water on themselves in aid of a good cause, this YouTube channel seems to be compiling the majority into playlists. Who’s your favorite so far? Watch the first trailer for the upcoming adaptation of Ian MacEwan's novel "The Child in Time", starring Benedict Cumberbatch. Benedict Cumberbatch ditches his dreamy demeanor to play the head of the Leave campaign. It's not pretty. Benedict Cumberbatch, Colin Firth, Richard Madden and More – All in the Same Movie! All your British actor faves are about to be in a movie together - directed by the guy who does James Bond films. Whew.